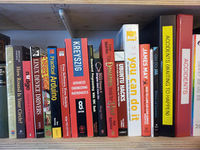 The Hackspace Library consists of books donated or long-term loaned by members. We have collected some good books (and some that should probably go in recycling). The focus is primarily on making, hacking, reusing and Terry Pratchett. It is located in the Comfy Area, creating a dividing wall between the Studio and the Comfy Area. The Catalogue is a work in progress and edited by Kate. The catalogue is organised according to the Dewey Decimal Classification. See the list of Dewey Decimal classes for the order. Books can be borrowed if they are not Long Term Loans. TinyCat will be the method, but it is currently being organised to make it easy to note that the book exists, but is out with a member. 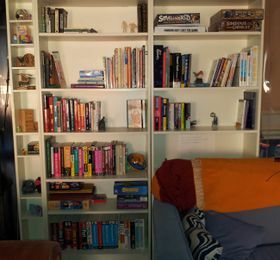 Close up of some of the books available to borrow circa 2012. Donations are always gratefully accepted. All donations should go initially onto the "New Book Depository" shelf, so that they can be recorded into the system. Once they're in the catalogue, they will be moved to the appropriate shelf. Long-term loans of books are appreciated. Currently, please place a post-it note in the front of the book with your name. This will then be picked up by Kate, and added to the catalogue notes. There will (and should) be books in the library that can be converted into other uses. These books will be marked in the catalogue as "Hackable" and will have a post-it note inside stating so. If donating books that can be hacked, please place a post-it note in the front of the book with "Hackable" on it. If hacking a book, please take photos of your work, so that we can show off the awesome work you do. If you want to have these in a place where other members can read them, please consider leaving them on the coffee tables in the comfy area, in the kitchen, or in the blue room. Please improve this page by adding a photo. Click to upload an image, help with using images can be found here. The talk page may contain suggestions about suitable images. The Hackspace also has a Nook Simple E-Reader, named NottingNook. It is located in the abridged Last Of The Mohicans book with the black elastic on it. NottingNook will host a wide range of out-of-copyright fiction and non-fiction, including many books on making. The list of books on NottingNook is being created and will be on this site shortly. We ask that NottingNook does not leave the space. This page was last modified on 22 March 2019, at 20:34.